“Am I too [old/young/inflexible/weak/insert adjective here] to start yoga?” How many times have we personally said or heard someone else say that when the topic of yoga comes up in conversation? Age is just a number – a number on its own is powerless in limiting us in what we can and cannot do, but rather, it is our mindset that limits us. You are never too young or too old to embark on (or revisit!) your yoga journey. Dedication, commitment and willingness to navigate the unknown and overcome obstacles (whether physical, metaphorical, figurative or emotional) is what truly matters and where the magic of the yoga practice resides. The beauty of yoga is that it accepts you as you are in your current state - the only prerequisite is your willingness to show up on your mat and do your work. By facing your own obstacles and either learning to embrace it or overcome it, that is your yoga and that is the essence of the yoga practice. Art historian, field anthropologist and also dedicated Little Mandarin student, Michael Gunn, puts it beautifully: “It’s not easy, but if it was easy it wouldn’t be worth doing”. 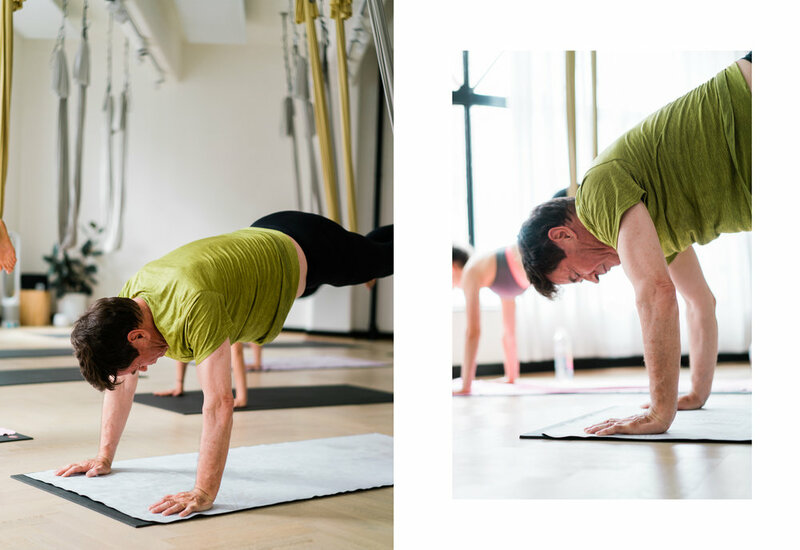 If you’ve ever thought about yoga and then dismissed it for whatever reason, you might give it a second thought after reading about Michael’s experience. 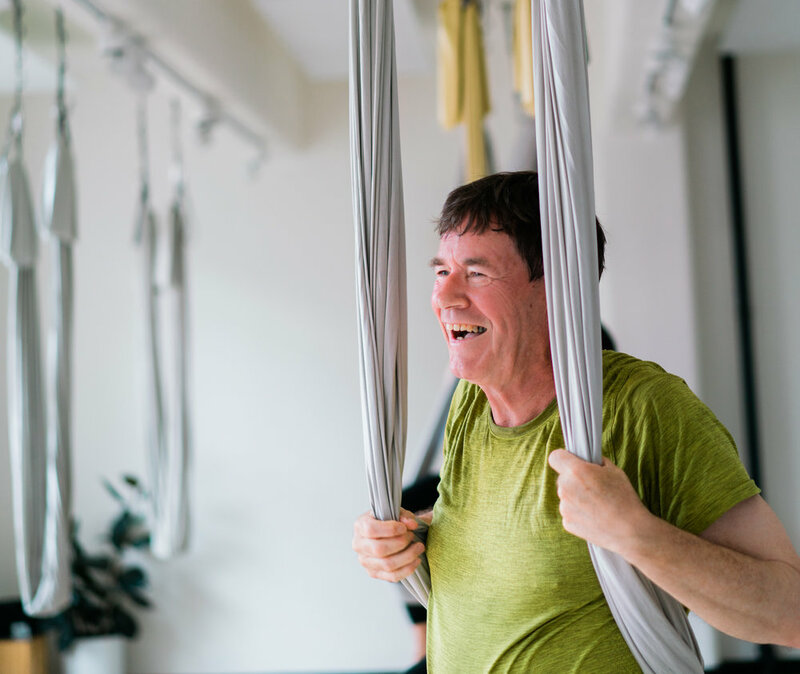 We chatted to Michael back in November 2017 after he had been practising yoga for 5 months (learn more about Michael and how he started his yoga journey here). 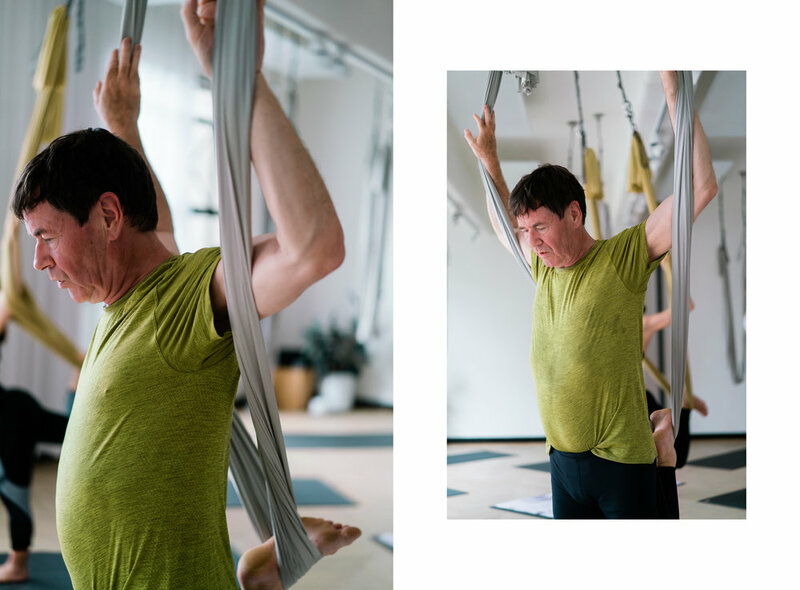 Let’s catch up with Michael as he reflects on his yoga journey after more than a year has passed and see how his dedication and willingness has evolved his practice since we last caught up with him. Question: We last interviewed you after you had 5 months of practice under your belt. Time sure has flown! How has your understanding of yoga evolved now that you have been practising for almost 2 years? I knew that yoga is an ancient practice that had its roots in India, but I knew nothing about it as a practice and as a discipline. Now, after two years, I can see yoga in art; in movement; in focus. Sometimes I think that yoga is filling a gap that the departure of organised religion is leaving in people’s lives. I’m not a religious person, but I seem to have spent a lot of my life in the spiritual side of things, like art. Now yoga. Although yoga is very much a group practice focusing on stretching and disciplining the body, it also develops a sense of oneness or wholeness; on being and nothingness; on mind and body; on now and beyond; individual and group, yin and yang. Stillness and movement. Stillness and emptiness. Maybe yoga is a state of being or a condition of being. I’m definitely more aware of the difference and relationship between mind and body. This awareness is more like becoming aware of a city by living in it and exploring it, rather than just reading about it from a distance. In yoga, I am physically and perhaps mentally exploring the limitations of my body. I am much more aware of my body than I was before I started yoga. I know now that my limitations, or at least some of them, can be overcome. I accept my body and its limitations more than I did previously. Q: On that note, how has your practice evolved? Both mentally and physically? Any milestones you don’t mind sharing with us? I find it difficult to be objective about my mental state, but I have a feeling that I am calmer than I was before I started yoga, and maybe a little more focused. But this calmness could be due to a number of factors, including social contact at Little Mandarin, for the students, as well as instructors, are interesting people. I like coming to the yoga studio. I also think that I have become more accepting, less reactive. But I have a long way to go in this direction. One of the more interesting experiences I have had at Little Mandarin was a heightened state of awareness during an unofficial meditation session conducted by one of the instructors. For a few moments, I felt a clarity of thought and understanding that I had not experienced before. It was transcendent. It was something I want to experience again. Certainly I feel better about myself as a physical being, I walk for 35 minutes to get from my apartment to Little Mandarin, and lately, I find it an easy walk, not at all tiring. I often pass men who are probably about my own age, and I wonder why they look so sad and beaten. Perhaps I look like that to them, but I don’t feel it. I often find myself stretching upwards, for pleasure, reaching for things from the top shelf, in doing so finding more flexibility in my shoulders. Even turning around in the car to reach for something in the back seat behind me can be a pleasure because now I can do it, previously this sort of turning was beyond me. When I become aware of my posture, I try to sit more correctly, or walk with my shoulders back and chest out, but this awareness is not yet fully part of my being. My yoga practice changes slowly, for there are many aspects of yoga that are beyond my ability. I am more aware of the rhythms and sense of flow which the instructors work through. I know I should focus only on my own practice, but I still look at other students in the class for understanding and clarity if I cannot see the instructor clearly. 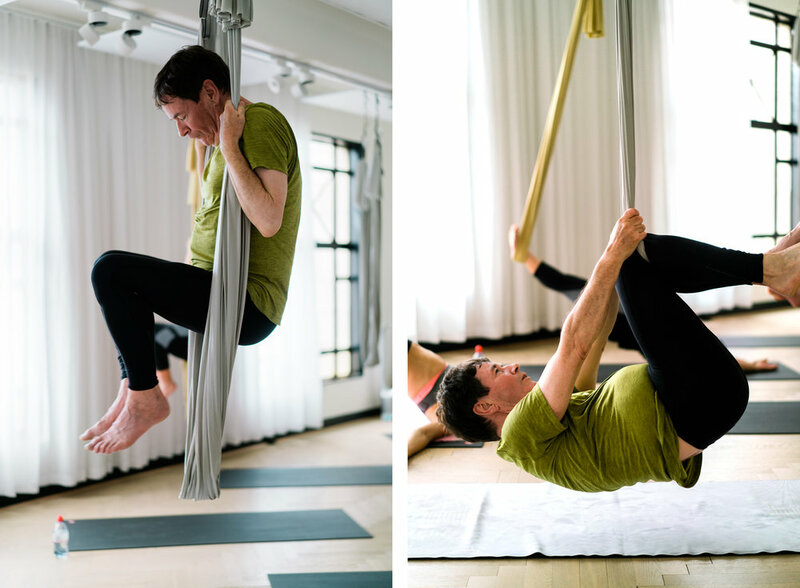 Q: You practice both mat and aerial yoga with us so we assume you love both modalities! What do you like about each style and why? To me, mat yoga and aerial yoga are very different forms of yoga. Mat Yoga is a sequence that I can engage in with greater or lesser success. Each session I am brought to the edge of my ability, sweat pouring from my brow, joints aching, and then the final release of shavasana [corpse pose]. Aerial Yoga, for me, requires more strength and flexibility. Students learn basic techniques and terminology in the Aerial Intro classes. The more advanced classes [Aerial Flow] build on previously established moves so that, in effect, there is no halfway in most of the sequences. In these more advanced classes, I feel my lack of core strength and my excess weight. Since I started yoga two years ago I have lost around 6kg, and feel that if I could lose another 6kg I would be in a better position to keep up with the rest of the class. However, I do feel as though I am improving, if ever so slightly, particularly with hamstring inflexibility, and in the shoulder-blades. Q: You always have such varied experiences in your work and travels. What are you currently working on? Please share with us one thing from your yoga world and one thing from your personal/work life. What am I working on in yoga? Apart from my hips and hamstrings and shoulders and balance and everything else that is getting worked on, I am trying to understand more clearly the essential philosophy of yoga, which appears to me to be a form of meditation – a mindfulness. I want to find that transcendental state again. In my work life, I am an art historian and field anthropologist. I research ancient art traditions in the Pacific region and have spent most of my adult life researching and writing about art traditions in New Ireland and in Polynesia. I have visited many villages all over the Pacific region. When I go there, I stay with people and we talk about sculpture. At the moment, I am working on a paper I am going to give at an international conference in Brisbane. The paper is about an image called ‘The Ambum Stone’, which is an ancient work of art from the Highlands of Papua New Guinea. In 2015, I visited the place where it came from and next week I am going to present my findings. Q: We are always inspired by your determination and willingness to learn (and always with a massive smile too!) whenever you are in class. What advice would you give to those wanting to try yoga but feel that yoga is not for them due to age, misconceptions about needing to have a certain level of flexibility or strength prior to starting yoga? I can only reflect on my own experience, which began with the sudden realisation that yoga was what I needed to do, despite the fact that I knew nothing about the discipline. After my first session at Little Mandarin, I knew that I had found the right road for me. I also knew that I was old and stiff and quite out of shape. I had never paid much attention to my body, viewing it merely as a vehicle which seemed to require little maintenance. In my young life, I had been a long-distance runner, a cyclist, and a skier, and my body and my temperament seemed suited to these individual sports. I was never very good as a team player, but I could go a long distance. For me, yoga is not something I can just pick up then not do again for a few weeks. I have to work at it every day and make sure that I do not give up. I feel that if I stopped yoga for anything other than travel then I would probably not take it up again. It’s something I need to persist with. When I started yoga I was starting to feel my age and was slowing down. However, even though I was clearly the oldest and least fit member of any of the yoga classes, I was never made to feel as though I was rejected, I was always included. Gradually my fitness started to improve, and I found that yoga was becoming an integral part of my life, and as I was able to come five days a week, I began to see more of the Little Mandarin studio. To me, one of the great advantages of yoga is the non-competitive approach. We all work to improve ourselves, but not at the expense of our emotional well-being. I come to each session, knowing that I am the oldest and least flexible, but also knowing that age and tight hamstrings are not the limitations I thought they were. 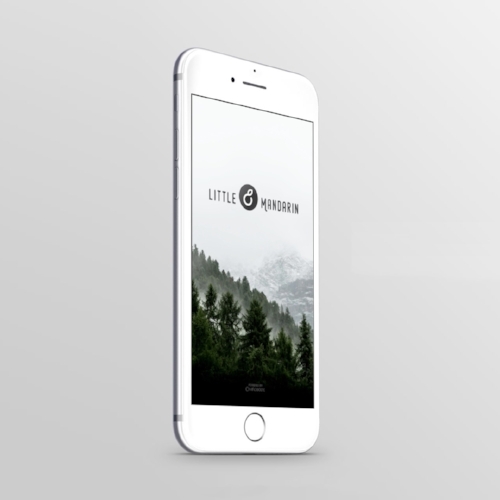 We work with what we have and are continually encouraged to go that little bit further. If I was to offer any advice to someone who is older than most, I would suggest persistence. Keep coming, keep moving, try to understand what is happening, and try to understand what the instructor is saying. It’s not easy, but if it was easy it wouldn’t be worth doing.